I'll admit it: this is the new coach I'm most dubious about. Thump and starBUCKS like this. Woah now. Careful out there on that branch. MililaniBuckeye and Thump like this. He'll be fine by me as long as he doesn't have inexplicable games where he gives up 50+ to offenses barely ranked inside the Top 100.
kujirakira and RugbyBuck like this. Systems_id, gmen6981 and RugbyBuck like this. Was listening to the The Ozone podcast, and they had an interesting story portion about Coach Mattison. Apparently, there's a TTUN part of practice where the players do reps to the amount of days until The Game, and while doing the drills the TTUN fight song is playing, players are getting hyped, etc . Mattison turns to Coach Mick and wonders why they're making such a big deal when the game is so far away ... I'm sure Coach Mick just shot him a "WTF" look and told him its THE GAME. It's funny to see how the mentality of scUM coaches is compared to the utter intensity that OSU coaches look at the rivalry and pass it down to the players. Kind of the difference of going overseas for trips, while the other team is sweating and bleeding together at the facility already getting ready for the next season. No wonder OSU has had such a recent dominance over scUM. kujirakira, lvbuckeye, Go Bucks!!! and 3 others like this. Morning Constitutional: Why Did Greg Mattison Leave Michigan? When the rumors about Ryan Day making a play for Michigan defensive line coach Greg Mattison first began, they were pretty surprising for a number of reasons. The main one being that Day was targeting Jim Harbaugh’s staff. Not that it’s a no-no, but it’s always a story when a coach leaves for a rival school. 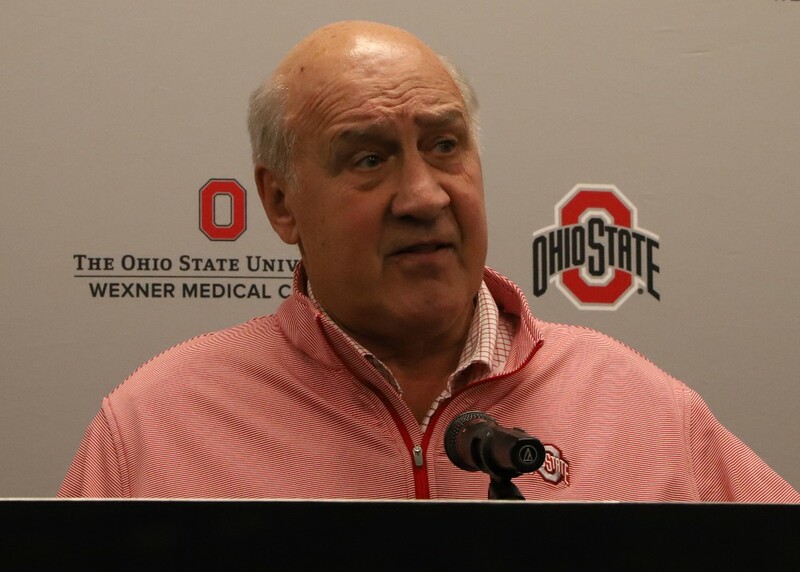 There were other reasons as well, like Mattison’s age, or the fact that the Buckeyes had no need for his specialty, which was defensive line coaching. Day didn’t see these as reasons not to hire Mattison, but rather reasons why he was such a good fit for the Buckeyes. Mattison eventually accepted the job offer and he now gives Ohio State another of the most respected assistant coaches in college football. But why did he leave Jim Harbaugh’s staff? For that, you have to understand what his responsibilities have been of late, and what he would like them to become again. Had he remained at Michigan, nothing would have changed for him and he would have been in 2019 what he has been every year since 2015. “Defensive line coach, and that’s what I was for the last four years,” Mattison said. “With Coach Hoke I was the defensive coordinator, and two or three of the years with Gary Moeller and Lloyd [Carr] earlier I was the coordinator. Despite the resume and the comfort level and the places he has been, he still had a desire to coordinate a defense.